Remember that whenever a software product ships, it’s a compromise, and new ones more so than revisions. When 1.0.0 of Photos was released, Apple was already hard at work on 1.0.1, and if it conforms to the usual schedule within one to four weeks, we’ll see a doozy of an update that mitigates some of what we’re wrestling with now. Endure! Photos’ different approach to displaying location information embedded in a photo or video’s metadata have caused the most consternation, because Apple has chosen an entirely different approach. Images reveal that they have a location tag with an overlaid pushpin on a square as long as that metadata detail is set to display. With the Info pane visible (Windows > Info), any image, video, or multiple selection that contains geotagging information will appear on a map at the pane’s bottom. 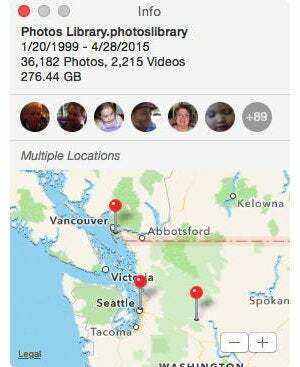 With nothing selected, the Info pane shows the coarse placement of all photos in your library. You can zoom in to see fine detail about where images are clustered, but there’s no way to select a moment from that map, which seems like an oversight. 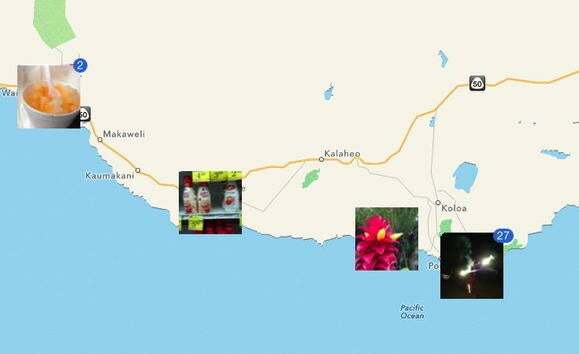 When you click the location information to the right of a moment name that has geotagging information, Photos reveals the images on a map in its main view. We’re all assuming Apple will add the ability to geotag media in a future release, although it’s hard to know philosophically if they’ll return the Places view—perhaps as an album, as it treats Faces. The switch to moments as a key organizing metaphor has caught people off guard as well, and many are still trying to sort out how to adapt their previous method of working to Photos or restore what they had. If you aren’t seeing a list of albums and other special items at the left of Photos, choose View > Show Sidebar. 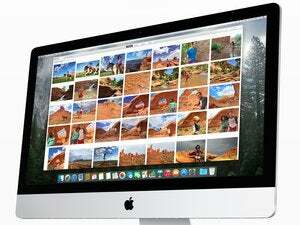 Several readers asked about converting iPhoto Events, which aren’t supported in Photos in lieu of moments. In the Albums list, you’ll find iPhoto Events as a folder. Inside are all the Events from iPhoto. You can drag these into the main Albums view or create new folder hierarchies. Luis Quinones found 800 albums created from Events in one of his imported iPhoto libraries, and wondered if they could be converted to moments. Unfortunately, Photos automatically identifies moments: there’s no way to override and create them yourself. The Info pane shows additional metadata, such as the item’s description. Several readers preferred to merge multiple Events into a single one, and are not sure what to. 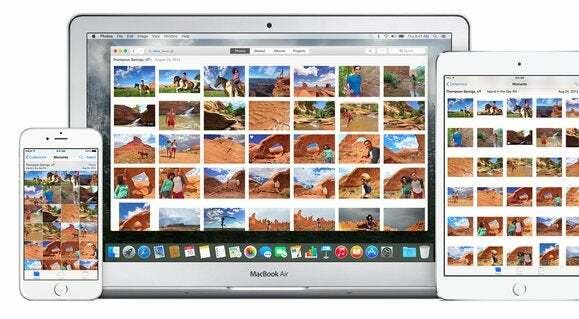 In Photos, automatically created moments and user-created manual and smart albums are the only organizational tools. And albums can’t be merged: you can re-order them in the sidebar under the Albums label, but you can’t select multiple albums in the sidebar or drag one on top of each other. Keywords: A tag icon overlays the image which, if carefully clicked, reveals associated keywords. However, the keywords can’t be clicked. 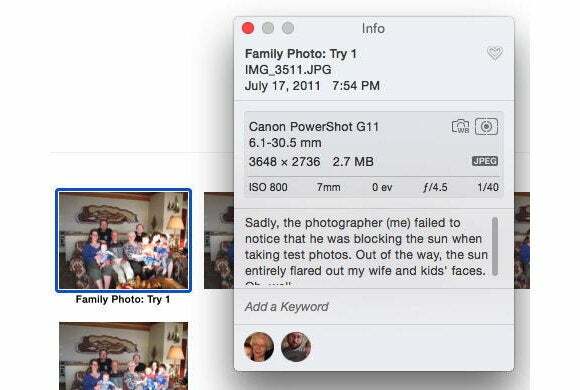 To search by keyword, you have to enter it in the Search field in Photos’ upper-right corner. Favorite: This reveals whether you’ve marked an image as a favorite and also lets you click while hovering over it to give it some love. Referenced File: Images that aren’t stored in the Photos library but elsewhere have a square-plus-arrow icon. Choose Show Referenced Image in Finder by Control-clicking the image or, with the image selected, choose the item from the File menu. A caption or “description” doesn’t appear in any view, but will appear in the Info pane when the image is selected.